Today two construction sites join our database, courtesy of the Supreme Committee for Delivery and Legacy. Current photos prove there’s no room for allegations about people dying at the 2022 World Cup stadium construction sites. 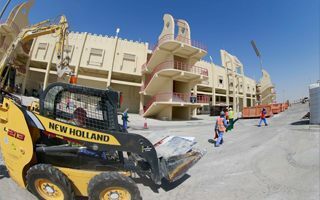 However, this doesn’t apply to other sectors of Qatari preparations, some of which are well underway. Along initial plans from 2010, the stadium in Al Rayyan (western outskirts of Doha) was to be retained for the 2022 World Cup. After all, the then-7-year-old stadium was considered one of the best in Qatar. It was supposed to have a temporary upper tier and thoroughly revamped infrastructure. However in 2014 the plan was changed. Demolition and building of a new 20,000-seat stadium in the same spot proved to be a more suitable solution, allowing for better accommodation of the temporary 23,000-seat sections. Those are to be dismantled and donated to developing countries after the tournament. Final concept of the stadium is to be presented in December. Up to 90% of the old stadium is to be reused both as equipment for other stadia (floodlights, transformers, seats) and construction material (recycled rubble). The new arena will be surrounded by an extensive public green complex with amateur and professional sports amenities. Demolition began on September 30, 2014 and the delivered new stadium should be ready by the end of March 2019. While initial announcements have put the construction in just one-year-long time frame, reality verified these plans. Groundbreaking took place in May 2014, but enabling works on the solid rock-base proved a lot more complicated. Now proper construction should start in 2015 and this is when contractor will be known. What is known is the design, presented last year and subject to comments far beyond the football and architecture world. Creating the design for Al-Wakrah's new stadium was assigned to AECOM and Zaha Hadid in June 2013, while first renderings of the venue were shown in November of that year. The stadium was designed with links to local maritime traditions, using waves on the roof cover and wooden ribs underneath the cladding to make the interior of the roof resemble the structure of traditional boats. Under main roof arches of 230m each there are stands for 44,000-45,000 people on two tiers. The entire upper ring of seating is to be demounted once games of the 2022 World Cup end, leaving half the initial capacity. The stadium is to ensure comfortable temperatures to fans with shade, aerodynamics and mechanical ventilation systems used to minimise the impact of heat. Around the stadium a vast 585,000 public space is planned with two training fields cooled to 26 degrees, two indoor halls, four tennis courts and two basketball pitches, among other sporting infrastructure. Also a 10,000 sqm retail complex and a four-star 150-room hotel are planned.